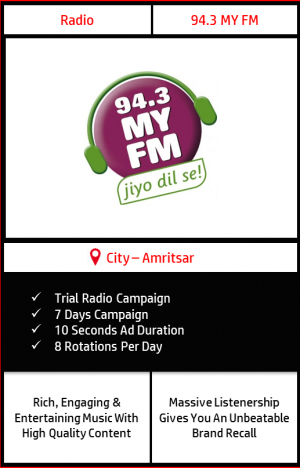 Advertising Medium – Radio Advertising On 94.3 MY FM, Amritsar. No charges to listen radio: People don’t have to pay to hear radio, that’s why it is most preferred by everyone. With the best RJ’s and Super-hit music, MY FM target a massive audience including mid night shows. 8 rotations of 10 seconds each would be played per day consecutively for 7 days on 94.3 MY FM, Amritsar.